The big reveal for one of my guild’s challenges is tomorrow night. 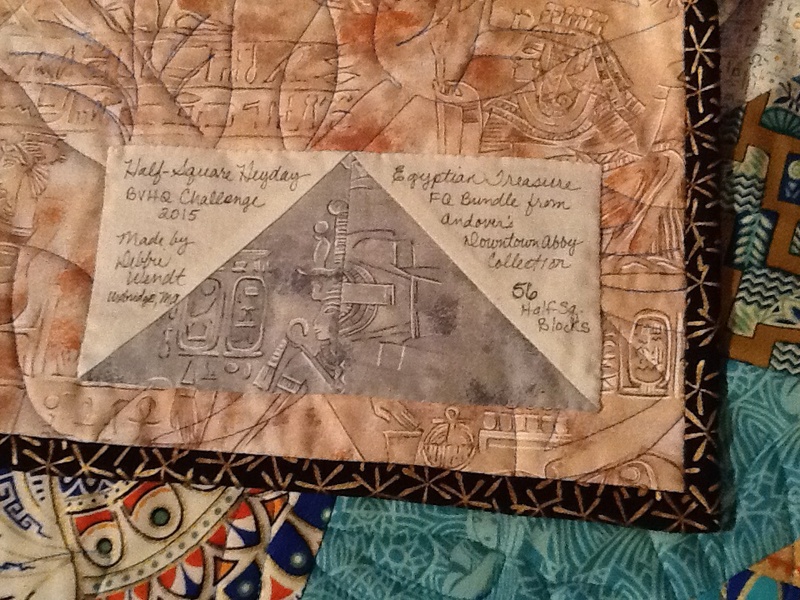 My Egyptian Half Square Heyday quilt has been quilted, bound, labeled and ready for the meeting! I love it when I finish early and I’m not madly stitching minutes before it is due. Procrastination is my middle name most of the time…..it feels very good to be ahead! YES! I said the label is on! That hardly happens. Do you label your quilts? Please do! It identifies your quilt and gives well deserved credit to the maker. See my label below. Notice I even used half squares for the label. I’ve started doing fun labels! It makes me happy and ties the front to the back. #1 – Label your quilts! Identify name of quilt (if you have one), who it is for, who is the maker, where and when it was made and any other information you want to add. We’ve talked about quilting and picking designs to enhance the quilt. The design for this quilt was about keeping it simple. I used a panto from MeadowLyon. It disappears on the busy fabrics. It was probably not the best choice but I like how it plays peek-a-boo in and out of the fabrics. The lotus flowers mimic the designs on the fabric. This quilt is about being fun, making half squares and getting it DONE! It will be a good snuggle quilt for my family. To add to the yummy-ness, I used 100% bamboo batting from Winline Batting! You can find them at http://www.winlinetextiles.com. This quilt’s binding was stitched onto the front and hand sewn to the back. I could have sewn it by machine but I wanted the hand sewn look for the back. (You can see the back on the label photo). Since I used a fat quarter bundle for the top, I didn’t have much fabric leftover. I did not put on any borders so I wanted the binding to be the frame. I found a great black with gold stars that complement the fabrics. It was the perfect frame. 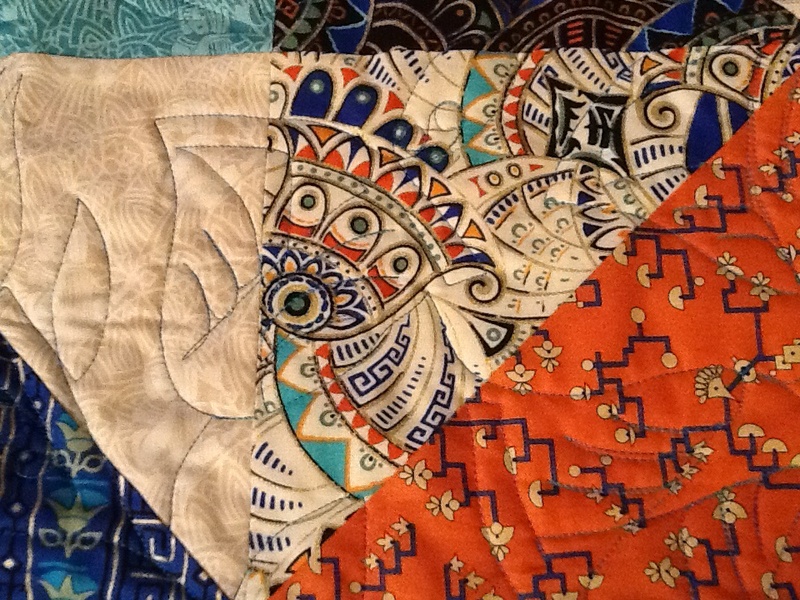 #2 – Choose binding to complement the quilt! 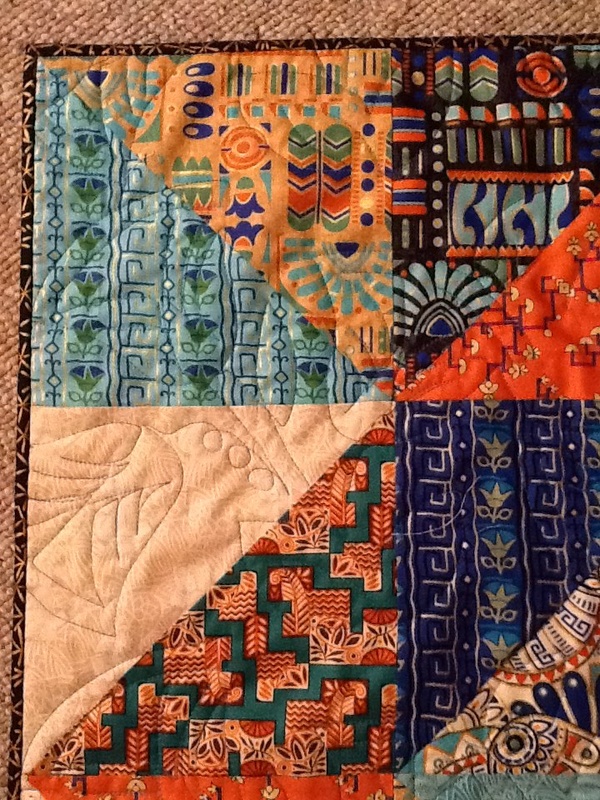 This entry was posted in Brilliant Bindings, Half-squares, Quilting, Tips, Uncategorized. Bookmark the permalink. Love your simplicity of this quilt. Also the off center design is a hit for me….eye catching.